Just as there are many types of periodontal diseases, there are many treatment options. Dr. Layport looks at you as an individual and develops a treatment plan that is tailored to your needs. • To clean and reduce periodontal pockets (flap surgery). You cannot keep deep pockets clean and free of plaque just by brushing and flossing alone. The pockets may also be too deep even for your dentist or hygienist to clean. Therefore, your periodontist may decide that surgery is necessary to remove plaque and calculus below the gumline. The gums are lifted away from the teeth to allow access for cleaning and smoothing of the tooth roots. 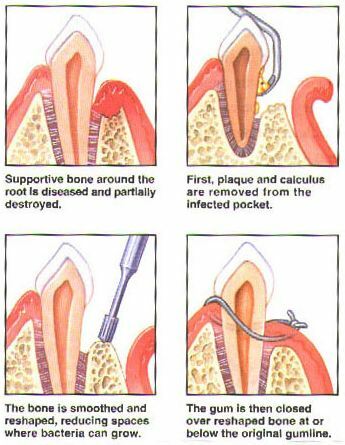 Your periodontist will reduce the pocket and reposition the gums with stitches to minimize areas where disease-causing bacteria can hide. • To reshape damaged bone (osseous surgery).This is done to smooth the uneven or irregular surface of the damaged bone and to promote proper healing of the gum tissue. This is done along with flap surgery.